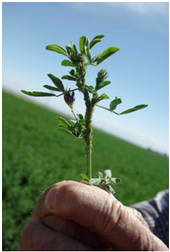 Of all of the insecticides evaluated against blue alfalfa aphid (BAA) by Eric Natwick of Imperial County, almost every insecticide applied to alfalfa this spring gave initial knockdown of BAA. Blue alfalfa aphid populations resurged in 7-10 days. Treatments giving 70–75% control (reported by PCA’s) were combinations of a pyrethroid with an organophosphate.